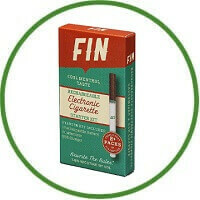 Fin E cig is an adequate substitute for those transferring from analogue cigarettes. Even though the tobacco flavour wasn’t fantastic, it also doesn’t have the same acrid taste, you can sometimes get with real cigarettes, it is still working if you give it a try. 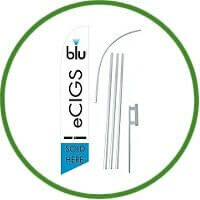 Fin is one of the most easily accessible electronic cigarette brands in the market. It is a family owned and operated in America and it is available in almost every store that you walk into. Fin electronic cigarette is one of the few disposable electronic cigarettes available. Fin e-cigarette, formerly known as Finity, has left many people wanting. In terms of quality, it has been described as okay, not as good as they have already had, but not as bad as they would have imagined it to be, given its price. They have a simple design, that of the traditional cigarettes of white and brown. Some people may prefer this because they tend or not stand out in a crowd of people. Fin e-cigarettes have a much simple ordering process, not too many things to fill in compared to other companies. In addition to that, it only comes in two flavours, that is, menthol and tobacco. This makes it an easy choice for a person. When you get the starter kit, this electronic cigarette comes with a wall charger and a USB cable, but that is not new to any vapour, it is a standard set. Fin e-cigarette may not be the best quality electronic cigarette in the market but it gets the job. It is especially advisable for people who want to cross over from traditional cigarettes to the electronic ones because it can give a smoother transition in comparison to other brands. Fin is doing a pretty good job at providing a decent vaping experience on a budget. Both the price and the ease of access are a big draw for many consumers. After all, a big part of the reason many people are choosing e-cigarettes is to lower the price, and many newer vapers do not want to have to go to the hassle of ordering cartridges online. Having it available in-store and at a cheap price is brilliant marketing. Looking over the packaging, it has a very retro vibe to it, reminiscent of vintage cigarette ads. The e-cig itself is obviously not the same quality as many on the market, but since it is less than half the price of most of them, it really isn’t expected to. Whether or not it provides a decent vaping experience is very important. Fin actually delivered. This cheap product actually provided a full throat hit, and a satisfying amount of vapour. It doesn’t produce huge billowing clouds of it, but for someone who is looking to start using e-cigs, it is more than enough to get you by. The taste was decent. It didn’t taste like chemicals, or like the economical one. It had a rich enough taste to be enjoyable, but lacked a lot of the depth or complexity that you get with higher-priced e-cigarettes. I believe that it would make an adequate substitute for those transferring from analogue cigarettes, though, because even though the tobacco flavour wasn’t fantastic, it also doesn’t have the same acrid taste you can sometimes get with real cigarettes. Another thing that critics like to point out as a downfall to Fin is that their flavour variety is limited to Tobacco and Menthol. Each flavour offers what is basically a mild, medium, and bold version, depending on the amount of nicotine that it contains. I don’t necessarily see that as something to criticize. By keeping the variety down, they can keep costs lower, because there is less to engineer and produce. Besides, the majority of people who are looking to get into vaping in order to move away from regular cigarettes don’t need Cinnamon vapour. They need something that compares to what their usual brand is. Many e-cig and vaping snobs will put Fin down because it is priced so low, or doesn’t offer enough battery life or flavour options. When you strip away how it does in comparison to higher priced brands, though, what you get is exactly what you expect. It provides a vaping experience that is not just acceptable, but actually enjoyable. In my opinion, this is a great value for anyone who needs to take their budget into major consideration.